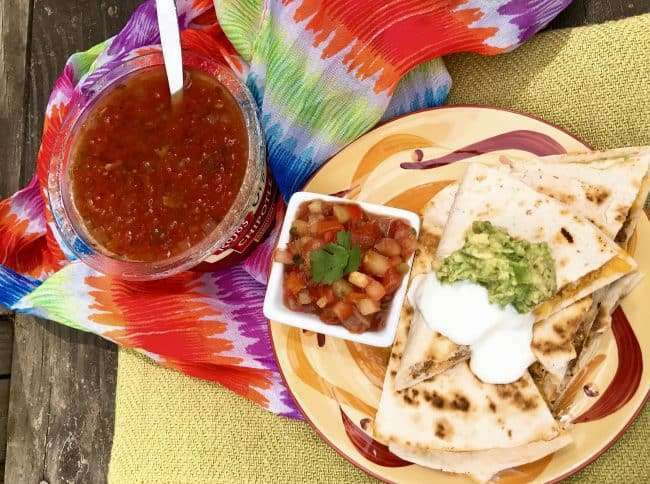 This recipe for Sausage and Egg Breakfast Quesadillas is sponsored by Rojo’s. They are perfect for breakfast at home or camping over the fire in a cast iron skillet. All opinions are my own. 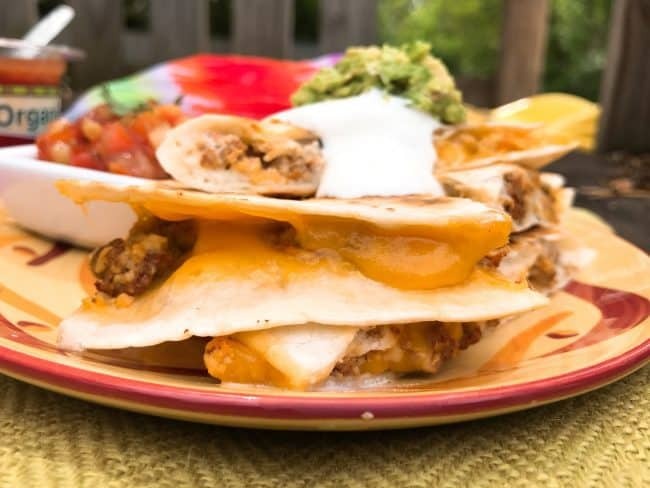 Quesadillas are cheesy goodness that sound good any time of day. The kids love those warm flour tortillas filled with ooey-gooey cheese for an after school snack. Quesadillas are also a huge hit for dinner when filled with lots of cheese and shredded chicken or steak. But what about breakfast? Breakfast quesadillas should be a thing. As I sit down to write this breakfast quesadilla recipe, Cinco de Mayo is just days away. It’s such a fun holiday to celebrate! 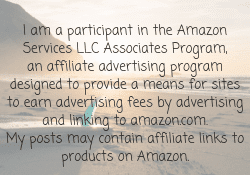 Why not enjoy it while camping in the great outdoors? The weather is finally warm enough to make a weekend away fun and not wake to freezing temperatures. The kids will love exploring and this breakfast quesadilla will the perfect meal to fuel your adventure all morning long. This recipe can be created indoors and out. When at home, you can cook it on the stovetop in a skillet. If cooking outdoors, I like a cast iron skillet because it will help to distribute the heat and cook more evenly. As a heat source, you can use a BBQ/backyard grill, camping stove, rocket stove like the Solo Stove, or cook directly over a campfire using a metal grill grate. Cook over medium heat to avoid burning your food and keep a close eye during cooking. Related: Another easy and delicious outdoor breakfast is this omelette in a bag. To save time, I like to use premade salsa in omelettes and the scrambled eggs for this recipe. Using salsa is more convenient than chopping onions, tomatoes, and peppers. Plus I like the way it tastes! I like this Organic Chipotle salsa from Rojo’s because it tastes just like my homemade version. If you don’t like chipotle which is smoked dried jalapeño, I’d recommend Rojo’s Homestyle Salsa. It’s chunkier and more like fresh cut pico de gallo. All of Rojo’s salsas and dips, are made in small batches with high quality ingredients like fresh-cut tomatoes and onions. 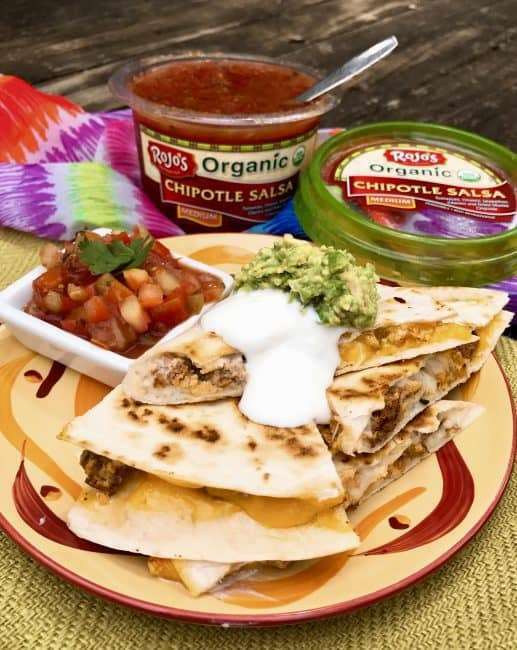 Whether you are celebrating Cinco de Mayo or just want to enjoy great salsa, you’ll love that Rojo’s delivers authentic freshness and flavor in every bite. You’ll find them in the refrigerated section at your nearby grocery market. In a large skillet or cast iron pan, cook chorizo sausage over medium heat. Stir frequently to crumble chorizo and cook 4-5 minutes or until cooked through. In a small bowl, whisk together eggs, 1/4 cup of salsa, salt and pepper. Add eggs to the chorizo and stir to cook as you would scrambled eggs. Remove scrambled eggs and chorizo to a plate. Scrap out any leftover egg from skillet and return it to the heat. Place one tortilla into skillet. Top with a handful of cheese and 1/6 of the scrambled egg/chorizo mix. Top with more cheese and fold the tortilla in half. Cook for 1-2 minutes or until the tortilla has browned slightly. Turn tortilla over and cook on the opposite side for 1-2 minutes or until cheese is melted throughout. Remove quesadilla from pan and repeat with remaining ingredients. Cut quesadillas into wedges and serve with sour cream, guacamole, and addition salsa if desired. This is what we’ll be enjoying this weekend and how I use salsa for something other than just chips and dip. How do you like to use salsa in recipes?